I like to try and keep up to date with the latest news about goings on in the Youth sector. I’ve got a dashboard page in my NetVibes homepage devoted to the latest information on youth issues and initiatives – particularly useful for sparking ideas about youth participation or promoting positive activities. One of the best sources for news about young people related news is The National Youth Agency’s press clippings service (Youth Issues News), which serves up a dose of the latest headlines every day. Frustratingly though, it’s not available as an RSS feed to slot nicely into my news dashboard – so, with a little help from folk on twitter, I’ve used Dapper.net to create my own RSS feed from the NYA press clippings. I thought other’s might find it useful as well, so if you want to use it, the simple copy this link here into your RSS reader and (if it all works alright) get daily updated headlines of young people-related news. This is the next in my series of one-page getting started guides – and the first of quite a few to be posted this evening. The concept for these guides is fairly simple, although one I'm still experimenting with. The goal is that each sheet should take someone from not knowing what a particular social media tool is, nor how they would use it – to at least having taken the first steps to using it in a sensible and sustainable way. And it should do that in no more than one side of A4. 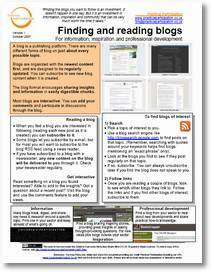 So – attached to this sheet is a getting started guide on 'Finding and Reading Blogs'. You can download this as a PDF for printing, or a word document to edit and adapt for your own use. If you or the target audience you may use this sheet with have not already started using an RSS reader then you may find it useful to start with this guide on reading RSS/Blog feeds with NetVibes.